Students of the Ninja arts have long been in awe of the shinobi’s fabled knowledge of remedies and poison. Most interest centers on the intrigue swirling around the subject of their skill with the preparation and use of assassinative poisons. While very little is published concerning which poisons the Ninja themselves employed when murdering their targets, there is even less written about the delivery methods they employed. Ninja unfortunately were not great at keeping diaries. All the publicly available information concerning the Ninja and their specific use of poisons could be recorded on the back of a large goose. This is hardly surprising, since 400 years later there is still no clear evidence that Lucrezia Borgia (1480-1519) actually used a “poisoning ring” to murder her victims. The Borgia’s were, like the Ninja, famous for the use of their poisons, but neither left us much in the way of information about their art. To this day no one can say what the composition was of the infamous “Canterella” poison which Rodrigo Borgia (later Pope Alexander IV) and his son Cesare Borgia employed in their shocking and murderous excesses. Their is suspicion that arsenic was a key ingredient, but that may be more wishful thinking than reality. The Borgias also were known to employ “time poisons,” which as the name indicates, allowed them to murder their opponents slowly, dragging out the agony of their deaths. It is assumed by many that the Ninja also used “time poisons” in their assassination arts, but, again, without verifiable sources or evidence. Accurate information is sometimes passed through generations by word of mouth or oral history as we prefer to call it these days. So it may be that the ninja employed “time poisons.” It may well be, too, that, as was rumored concerning the Borgias that their mastery of the poisoning art was unsurpassed, but that does very little to satisfy our curiosity concerning such things. So it was great pleasure that I read a modern book detailing the activities of a covert organization every bit as feared in the art of assassination as the Ninja themselves- the KGB. The KGB’s Poison Factory should be of interest to every student of the Ninja arts, because it does more that re-tell folklore and legends. It details the facts and events of an organization that not only considered poison as a legitimate part of its agent’s repertoire, but developed both the types of poisons it used and the delivery systems into a fine art. “Here, for the fan of murder thrillers and modern history alike, is a cracking good read. In brilliant light we see what lay for nearly a century behind the London polonium poisoning of British citizen Alexander Litvinenko, former Russian. With original research guided by his insider’s eye and scholarly care, Boris Volodarsky recounts scores of murders. Assassination emerges as state policy, as institutionalized bureacracy, as day-to-day routine, as laboratory science, as a branch of medicine researching ways not to stave off death but to deliver it in apparently innocent or accidental forms, and as engineering technology, devising ever-new devices to meet each new requirement, from umbrella tips and cigarette cases and rolled-up newspapers — to Litvinenko’s teacup.” Tennent H. Bagley, former CIA chief of Soviet Bloc counterintelligence. In September 2004, Ukrainian presidential candidate Viktor Yushchenko was poisoned by dioxin, which caused severe illness and disfigurement. In October 2006, journalist Anna Politkovskaya, a critic of President Vladimir Putin and his handling of the Chechen conflict, was shot to death in Moscow. In November 2006, former KGB officer Alexander Litvinenko was poisoned by polonium-210 and died after several days of agony. Litvinenko was known for publicly alleging that the Russian government was behind numerous acts of terrorism against its own people, including Politkovskaya’s murder. These stories are familiar to most who follow international news. What many people do not know is that this type of assassination has a long history extending through Soviet regimes as far back as Lenin. 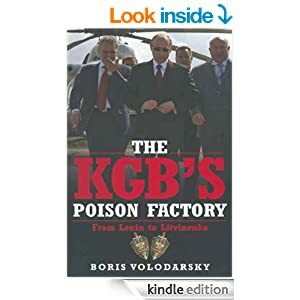 Volodarsky, a former KGB officer himself, provides evidence that eliminating enemies by poisoning or other means is still business as usual in Russia, despite the political changes of the past two decades…[The KGB’s Poison Factory] will fascinate students as well as general readers interested in international espionage. Boris Volodarsky is a former captain of the GRU Spetsnaz and currently an independent intelligence analyst, a member of the World Association of International Studies (Hoover Institution, Stanford University) and has written a number of articles on intelligence for the Wall Street Journal. He lives in England. Like both the ninja and the Bogias, the KGB found the use of poison an effective assassination tool. Volodarsky makes clear, too, that although this was a technique used by the Russian secret services going back at least a hundred years it is one actively employed in modern times. A primary focus of the book is the KGB killing of Alexander Litvinenko by the introduction of polonium into his body. This single, well documented instance gives us a small window into the ways in which covert groups make us of poisons and why. There are critical differences between KGB covert operatives and ninja operatives, of course. From one point of view, however, the only critical difference is that KGB agents took their orders and their paychecks from a single state organization while the ninja did not. Poor though their clothing choices frequently were, the KGB, however, were generally better dressed. But the Litvinenko murder can help us understand why poison is still to this day a viable assassination tool. The first and clearest reason that comes through this book is poisoning can be quietly accomplished, delayed in result, and more difficult than firearms to trace to the perpetrator. Radionucleides in our teacups is a far cry from poison darts from a shinobi blowgun, but honestly, don’t you think the ninja of old would have appreciated the horrifying elegance of it?